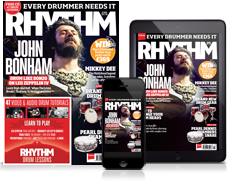 NAMM 2019: Has Meinl made the ultimate busking tools for drummers and percussionists? NAMM 2019: On the surface, Meinl’s Pickup Vertical Subwoofer Cajon is a regular box drum with a tasty Baltic birch faceplate and eco-friendly medium density fiberboard body, but delve deeper and you’ll discover a fantastic performance tool for live acoustic situations. Inside is a Piezo pickup which amplifies your playing when connected to an amp or PA through the quarter inch port. Discrete controls on the side enable you to tweak tone and volume with ease. Whether you’re busking with your band or playing an acoustic club set, you’ll certainly be heard. 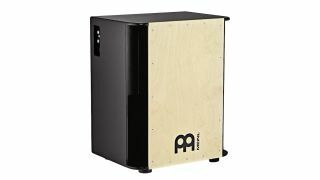 The cajon also features large, front-facing sound ports to help enhance and project bass notes, whether you’re amplified or not. If you already own a cajon but want a wider spectrum of sounds from the instrument, the Meinl Cajon Preamp is worth checking out. The device mounts to the inside top panel of your box and can be tuned to the particular sound characteristics of any cajon. A tone control helps you dial in the perfect mix of bass and treble, while the phase switch changes the overall timbre.